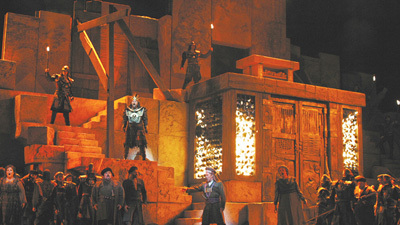 Met Music Director James Levine has always had a special affinity for Verdi’s breakthrough opera, which tells the biblical story of the Babylonian King Nebuchadnezzar. 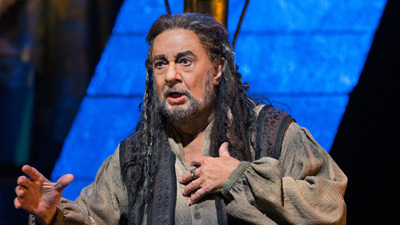 Lado Ataneli takes on the title role of the ruler driven to insanity by his blasphemous actions, opposite Susan Neves as the fearsome Abigaille, who tries to seize his throne. Francisco Casanova is Ismaele, nephew of the King of Jerusalem, who is in love with Nebuchadnezzar’s daughter, Fenena, sung by Wendy White. The great Samuel Ramey is Zaccaria, the High Priest of Jerusalem.